There is much speculation nowadays on “football diplomacy” policy initiated by the Armenian president in 2008 which, in fact, has contributed to the warming in relations between Armenia and Turkey. It is noteworthy that the football diplomacy factor had, actually existed long before, although in an absolutely different way. In short, the factor of sports has been used as a diplomatic weapon in Armenia-Turkey relations. The Armenian-Turkish protocols on establishing diplomatic ties between the two countries were signed on October 10 in Zurich. An interesting coincidence: it was again on October 10 but in 1973, when Yerevan’s football team “Ararat” won the Soviet Union Cup. After the Genocide, World War II and Stalin repressions, which again cost the Armenian nation massive extermination, it seemed that it would yet be long, before adequate national interests would take shape and find ways of expression. Especially that, public events like compulsory parades, different festivities and Socialist May-Day workers’ rallies meant to consolidate the society were more for the international rather than national unity. It was in that crucial interval in history when, all of a sudden, sports have emerged on Armenia’s social life scene as the most legal technique of expressing patriotic feelings moderated by the socialist mouthpiece. It wasn't accidental that in 1963 Yerevan’s “Spartak” football team was renamed “Ararat”. The period of national awakening dictated its own terms: Hrazdan Stadium was built for the future champion with oil magnate Calouste Gulbenkian’s financial support. Chanting by 70,000 unanimous voices of the name “Ararat” – in Hrazdan Stadium only a few kilometers away from the occupied national symbol – was probably more striking than a political demonstration. 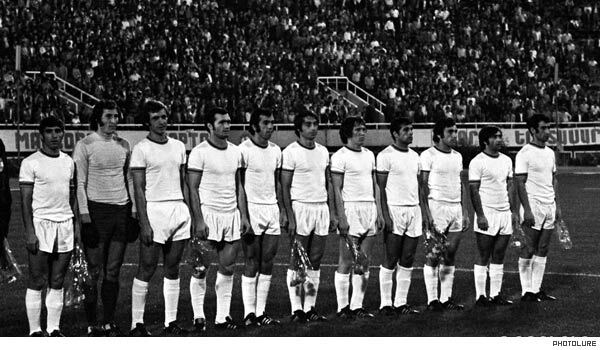 In the autumn of 1973, Yerevan “Ararat” became the USSR football champion, and on October 10 the totally packed Moscow Luzhniki stadium was flooded by Ararat lava: in the dramatic final match with Dynamo Kiev star team Ararat, for the first time, was to become the USSR Cup holder. Twenty years after Ararat’s victory, a player of the “golden” French national team Yuri Jorkaeff kicked a goal playing for Monako in a group tournament of UEFA Cup; after the match Jorkaeff, who is of Armenian origin, and who was noted for scoring a goal against the Turkish goalkeeper of Galatasarai (Istanbul football team), said: “This is my first answer to the Armenian Genocide”. That goal, however, was not a decisive one, but one such statement was enough to turn Jorkaeff into a persona non-grata in Turkey. In August of 1998 Ankara stated that it was unacceptable for Jorkaeff to visit Turkey as a part of the world national team to participate in the match with the Turkish national team devoted to the 75th anniversary of the Turkish Republic. The fact that Jorkaeff was nonetheless included in the star team arriving in Istanbul was perceived as a “personal insult”. However, by that time the football player - an advocate of the international recognition of the Armenian Genocide – had himself declared his absolute lack of desire to go to Istanbul anyway. Something similar took place also in 2000, when Jorkaeff refused to take part in the match between the national teams of Turkey and France scheduled for November 15.As Turkish newspaper “Turkiye” reported back then, “groundless Armenian accusations of genocide are now applied to major sports as well”. Three months later Yuri Jorkaeff together with another member of France’s star team – world champion Alain Boghossian – thanked French President Jacque Chirac for France’s official recognition of the Armenian Genocide.